In this modern era, we are well-known about the book illustration performs as the supplements of the written content. Such an essential concept of interior book designing is not an innovative idea of the modern publishing industry, rather it had been performing from the medieval era between 700 to 1500 centuries of India. Although, in the commonwealth library of London and in the British Museum, there is a manuscript demonstrated as the oldest manuscript of India, however, historians affirmed later that those were composed in 1427 and 1464 moreover, those were just a duplicate copy of “Kalpasutra”. In India, historians found the original copy of Kalpasutra as the oldest manuscript of western India composed in 1127. The book they found arrived in the damaged condition. In those said times (1427 and 1464) It seems someone did the copy just to preserve the original one. 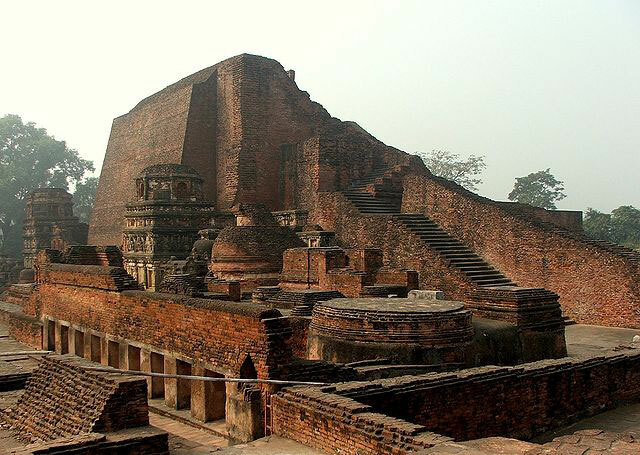 Nalanda Mahavihara, considered one of the first universities in recorded history. Based on the statement of historians, the arising of Gupta dynasty supports to regain the influences of Buddhist culture as well as the ancient caste system in Hinduism. But the difference was, the arose culture introduced as the Shaivite (a Hindu community who praised Lord Shiva as the almighty creator) In the fifth century, the impact of Buddhism had languished but it took more than 5/6 decades to fade the influence in all over India. It is true that the result of any lofty thing takes too long to demolish. The vital point in Buddhism was generosity. Anyone could be initiated in Buddhism. All were welcome in the Buddhist monastery. All had the right to take lessons on Buddhism. They believed, the caste is not the hindrance in Buddhist spiritualism to have the self-realization. Moreover, it was the principal in Buddhism that the substantial part of the donation came from the royal grace and through the begging of the individual, should be used to develop the monastery and to inspirit the Buddhism. It was the fundamental strength of Buddhism which boosts it to exist century-wide long life and still, Buddhism has not lost its importance. In the eighth century, a strong democratic manner of Buddhist culture influenced people in Eastern Indian and to end up the anarchy of the Shashanka dynasty, the people in eastern India concede ‘Gopala’ (a popular figure of the native royal family) as their ruler who could empower Buddhism in the Eastern part. In such way, Pala dynasty of Bengal established from the first half of Eighth century and had been dominated the whole eastern Indian up to twelve decades. According to the Khalimpur copper plate inscription, the first Pala king Gopala was the son of a warrior named Vapyata. Under the same roof of Buddhism, simultaneously flowing revolutions of the other spiritual communities such as Jain and Vaishnava got the shelter as well. Although the Jain society formed as a spiritual community; however, it had a material morality that defined as, - obey the duty for its society, development of the community and instigate the prosperity. Besides that, Jain community also believed in the highest spiritual destination of Self-realization just like as Buddhism. Vaishnava society formed as a devotional community who believed in the ordinariness or simplicity. Maitreya and scenes from the Buddha's life. Folios were probably from the Pala period under Ramapala, considered the last great ruler of the Pala dynasty. By so long, I have tried to draw the historical background to have a clear focus on the manuscript art in my later discussion. As I stated above, upbringing the Buddhism by the Pala dynasty, helped to get prosper in every aspect. With the assistance of the Pala dynasty, there were so many Buddhist monasteries and Shanghas had founded in eastern India and Nalanda Mahavihara was pioneering the Buddhist community of eastern India. In those centers, education, culture, and art reached the highest label and became the icon of Indian culture. Such unprecedented affluence sprayed up to 1608 which make astonished to the historians. Unfortunately, in eastern India, it was not possible to patronage the glorious fame of Buddhism due to the adverse climate and the attacks of the encroacher enemies. As a veiled result, India lost too many valuable ancient manuscripts, art that we could take as evidence. Will continue in next episode. 1 List price is without shipping cost and taxes.